If you're like me, you're constantly looking for values in Pinot Noir. What used to buy you a stellar bottle now gets you something passable. And what used to get you something very quaffable now gets you something on the fence between pedestrian and swill. So, when a reasonably priced Pinot with soft curves and an easy palate comes along, well, it's worth noting. Though the SRP is $27, I just saw this on the shelf for $20. That puts it into the attainable category and, for Pinot at least, makes it a contender to be a real value. 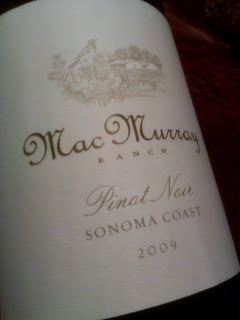 While short of moving or complex, this is text book northern California Pinot done well. The focused, deep cherry flavors are framed in nicely by spice and soft oak. The fruit component is probably its best attribute, though - honest and comforting. It's got a decent heft to it and the finish lingers like an invitation to return to bed. A pleasing wine that's built for savoring simply rather than analyzing to death. Put it on the list. And, as with all Pinots, decant for a few hours.